This design was done way back when I first started working between 2006 and 2007. I still love this design today because of it's simplicity, and complex concept. It feels and still looks timeless. I've also learnt a lot while doing research for this design, and some designs are loved based on their process, that's why it's being presented although the design was never used. Firstly, the shapes represent the owl eyes to accommodate the snowy owl - being awake and alert - which simply communicates 'security'. What’s great about the shape is that it's organic, yet modern. 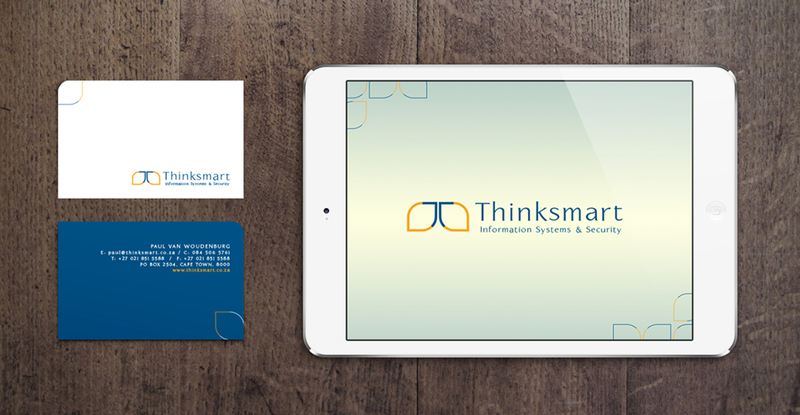 The blue shape (two “v ” arrows) forms a "T" for Thinksmart. Whereas the white negative space between the two yellow shapes forms an "I" shape for information. The meaning of yellow colour in this regard is to communicate 'clever intelligent thinking', for yellow awakens alertness. Also, the snowy owl has yellow eyes. Then blue represents safety and trust. Created 2007. Copyright © Zanli de Jager. South Africa.